If you’ve ever attended a conference or exhibiting event, you know the crucial role that your company’s swag plays in bringing over potential customers. And, to really succeed in bringing people to your booth, you need to have something both eye-catching and out of the norm. 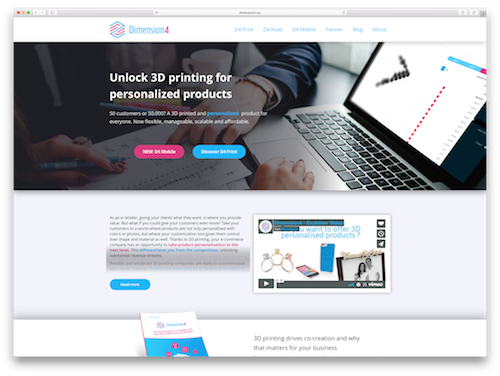 This week’s #WebsiteWednesday gives you that and more with their customizable 3D printing service: Dimension4.xyz. Dimension4.xyz is a 3D printing company that is unique because it’s not a standalone printing service, but rather allows you to design what you want to be printed using their intuitive platform, and then connects you to a global network of 3D printing service bureaus that will make exactly what you asked for. This service helps both the companies receiving the customized products, as they get a truly unique promotional item, and the 3D print manufacturers, as they get a highly specific list of client needs to ensure their customers end up satisfied. Dimension4.xyz’s system also provides customers buying 3D printed products countless options to create and customize, meaning the only limit is their imagination. Their commitment to simplifying the 3D printing process for both customers and 3D printing companies has helped them secure over $62,000 in funding so far. “At Dimension4, we help e-retailers in successfully adopting 3D printing as a suitable manufacturing technique for the mass customization of consumer products. That way, consumers can not only personalize products with photos or colours, but have control over shape, material and inscriptions as well. With our software, we automate and optimize the ordering of the 3D printed products, ensuring manageability and affordability for a large customer base. When you have a cutting-edge idea like Dimension4.xyz, you need your domain to match your vision. Dimension4 was able to brand on a domain that not only aligns perfectly with their company mission, but also helps them connect with clients around the world. If you want to see more of Dimension4.xyz, check them out on Twitter and Vimeo. To see more great .xyz end users, follow @XYZ on Instagram, Facebook, and Twitter. Nowadays, we expect to have information available any time of day, and right at our fingertips. From our personal relationships with friends and family to our transactional relationships with businesses, we want answers anywhere, anytime. 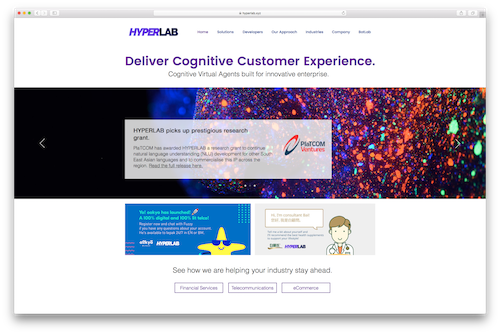 This week’s #WebsiteWednesday understands that demand, and helps businesses use cognitive virtual agents to satisfy their clients needs and keep them coming back; HYPERLAB.xyz. HYPERLAB is an Artificial Intelligence company based in Kuala Lumpur that has developed cognitive virtual agent services to help businesses improve their customer service, advertising, and international business systems. Today’s research shows the future of business-client interaction is automation, with Gartner recently predicting that by 2020, 85% of customer interactions will be managed without a human. With this in mind, HYPERLAB designed their A.I. to do anything human customer service employees do, from answering questions about health insurance plans, to planning your digital media advertising, and even fielding prospective clients’ questions as part of an interactive banner ad. Plus with industry leaders like Hong Leong Bank, MindShare, and more trusting in HYPERLAB’s platform, it just makes sense for businesses to get their own HYPERLAB cognitive virtual agent service. “As we witnessed customer experiences evolve from traditional channels, to digital and social media, we also found that customers have come to expect realtime support and services from businesses who struggle to scale and deliver this effectively. HYPERLAB was born to help solve these challenges for large enterprises in Southeast Asia. After securing $500,000 in funding last April, HYPERLAB recently had their work recognized by PlaTCOM Ventures, who awarded HYPERLAB a concept to commercialisation grant. PlaTCOM offers grants up to up to $283,000. HYPERLAB’s forward thinking technology and proven track record of success has set them up already as a major player in South East Asia’s startup scene, and thanks to their global .xyz domain their services can reach clients around the world. Inspired by HYPERLAB to start turning your great idea into a reality? Get YourIdea.xyz today! Nestled across from Boston’s historic waterfront lies a small neighborhood known as Boston Seaport, and it’s going through a big change. As the neighborhood develops and welcomes more new residents, it chooses to connect them all together through this week’s #WebsiteWednesday, BostonSeaport.xyz. BostonSeaport.xyz is the portal uniting the neighborhood’s restaurants, cultural institutions, event spaces, and residents. 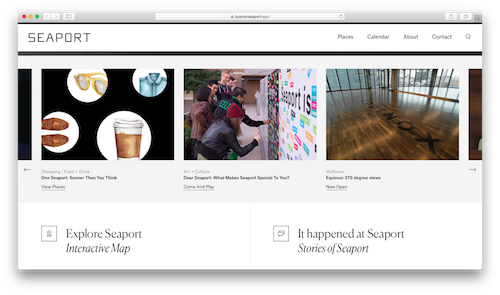 Run by WS Development, a Massachusetts-based property developer dedicated to creating people-centric spaces, BostonSeaport.xyz ties the community together through its constantly updating map of the area and calendar of events. All aspects – from activities and events, to food, tourism, and transportation – have their place on BostonSeaport.xyz. Just as the neighborhood has become a premier destination for Bostonians and travellers alike, BostonSeaport.xyz has become the go-to domain for all things relating to the neighborhood. BostonSeaport.xyz is the perfect example of an organization using a .xyz domain to bring people together. Location specific domains, particularly ones relating to big cities, are often difficult to obtain, but BostonSeaport.xyz was able to get their exact choice. If you want to learn more about BostonSeaport.xyz, follow them on Twitter, Facebook, and Instagram. And be sure to follow @xyz on Instagram, Facebook, and Twitter for more great .xyz use cases. As 2017 winds to a close, Team XYZ was happy to focus on continuing to foster the #GenXYZ community in November. Keep reading to get all the details, or check out the highlights below! 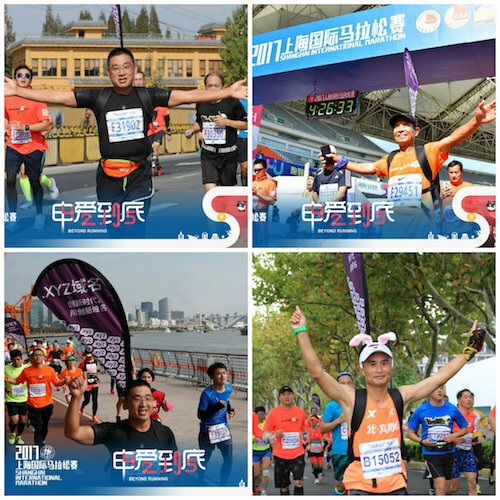 The #GenXYZ community in China always shows a unique passion when representing .xyz, and they were back it again this month at the 2017 Shanghai Marathon. The runners supporting .xyz in the race ran the entire 26.2 miles (or 42.2km) with .xyz flags streaming behind them, and they couldn’t have been more excited to rep .xyz! After trotting around the globe in October, it was great to spend some time this month right here in our own neighborhood of Santa Monica. 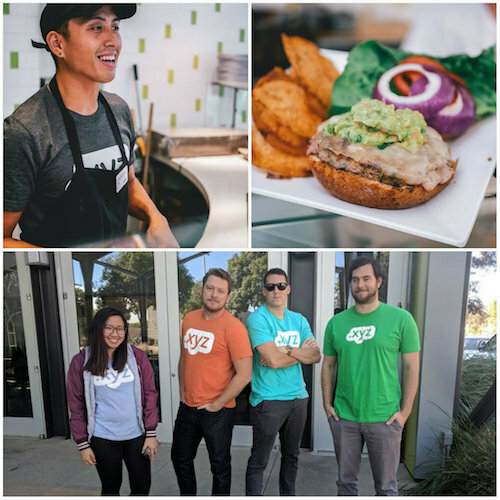 We started off the month by heading across the street to Lime Cafe, a favorite lunch spot around our office, and holding a pop up XYZ shop to hand out great .xyz swag and get the dozens of lunch-goers set up with their own .xyz domains. Lime even made a special menu item for us, and the “XYZ Special Burger” was the most popular menu item of the day! Be sure to subscribe to our newsletter to follow where we’ll be next. 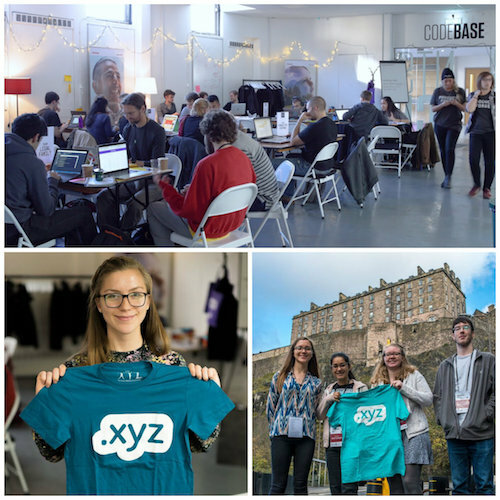 The innovation of #GenXYZ was on display again this month as our partner Product Forge hosted their Medical Visualization hackathon in Edinburgh, Scotland. The hackathon focused participants’ bright minds on creating solutions that will deliver precision medicine that is tailored for individual patients. They built their projects and can now bring those ideas to help the global healthcare industry thanks to their .xyz domains. The entrepreneurial spirit of our end users isn’t limited to just .xyz adopters. .Cars/.Car/.Auto adopters Waive.Car brought their new ride-sharing startup to ABC’s hit show Shark Tank, and went toe to toe with the sharks to secure an investment in their business. They even gave XYZ a shoutout, as we’re one of their first advertisers. Congrats Waive.Car, we can’t wait to see what waits for you on the road ahead! Over the past few months we’ve been getting ready to welcome another new neighbor near our office, Santa Monica College. They recently finished construction on a brand new campus just down the street, so we made sure to swing by for SMC’s homecoming football game to show our support and spread the word about .xyz to the students. We’ve only just begun collaborating with SMC, so be sure to check our Instagram to see what else we have in store! We’ve had plenty to be thankful for this year, and we were glad to have a chance to reflect on it as a team while celebrating Thanksgiving at the office. From the official launches of .Storage and the 1.111B® Class, to announcing a partnership that allows users to pair and trade Ethereum exclusively with .xyz domains, 2017 was a great year for us and for .xyz adopters around the world. We’re not done yet though, as we have plenty in store for December and beyond, so stay tuned to our blog for all the latest .xyz news. The average American spends 10 hours in front of a screen daily, and that number is only growing. If you’re going to spend that much time in front of a screen, why not have a little fun by personalizing it with your favorite characters? With this week’s #WebsiteWednesday, Shimejis.xyz, you can do exactly that. Originally created by Yuki Yamada of Group Finity, Shimejis are tiny, fan-made animated characters that wander around your computer’s desktop. Shimejis.xyz was created by Jarno Le Conté, a Dutch web designer and animation fan who wanted to bring the Shimeji program from your desktop to your actual internet browser. There are now hundreds of Shimeji characters from popular video games, animes, Disney movies, and webcomics to choose from, with fans constantly adding more adorable characters every day. 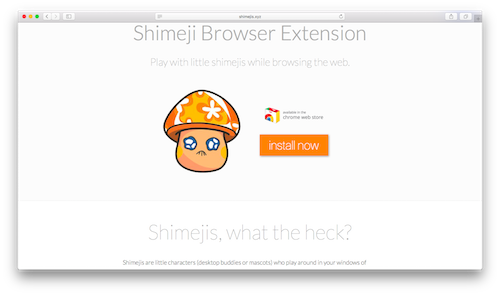 You can download the Chrome extension or visit Shimejis.xyz to get your own. As a Japanese creation that was modified by a Dutch web designer, Shimejis.xyz shows the truly global focus the #GenXYZ community has. If you want to see more great #WebsiteWednesdays, be sure to keep reading our blog. And make sure you follow @xyz on Instagram, Facebook, and Twitter for more great .xyz use cases. Starting today, .Storage domains are available to the general public for one standard registration fee, with no premiums, reserved names, or verification required. That’s right – all .Storage domains, including 1-character domains like i.Storage, 2-character domains like LA.Storage, and valuable keywords like Safe.Storage can be registered for as low as $46/month per domain at registrars like Gandi, GoDaddy, and Name.com (12-month commitment, prices may vary by registrar). .Storage is the trusted namespace supporting the entire $80 billion/year storage industry. Premium domain endings like .Storage have proven SEO benefits, including up to 50% improvements in search engine rankings, 30% increases in referral traffic, & 20% increases in social media traffic (Source: www.go.cars/seo). .Storage domains come with complimentary white-glove website migration, which uses Google’s best practices to move your existing website & emails to your .Storage domain with zero downtime & no lost rankings, emails, or traffic. Contact us for a complimentary consultation of recommended .Storage domains for your business. For more inspiration, check out some of our favorite active .Storage websites at www.Go.Storage/live, or claim your space at one of our authorized registrars.